The 2013 Conejo Valley Days took place last weekend, May 3-5 in Thousand Oaks, CA. This commemorated the 57th year of an event which honors the Conejo Valley’s rich cultural heritage and volunteer spirit. Wristband sales were used to raise funds for non-profit organizations including schools, PTAs, religious and social-service organizations. 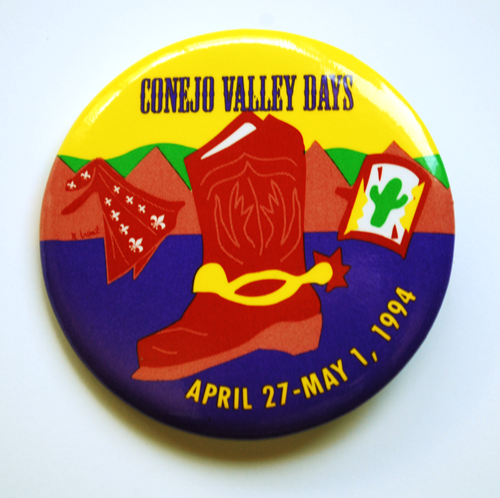 On a historical note, I was reminded of my 1994 award-winning logo for Conejo Valley Days. A sample of the pin is shown below. Here, I created colorful hand cut-outs of a western boot and a cactus as the design for the award-winning emblem. It was great fun to be a part of the rich cultural history in the Conejo Valley.